There was more kind of sad animal news in the newspaper yesterday, and it made me think of the power for good a preposition could have. But back to the story that was reported in The New York Times. It outlined an issue affecting zoos worldwide, which are responsible in part for saving many creatures from extinction. The challenges zoos are facing is how to manage their populations. Do you let females experience parenthood and then euthanize the weaned, or do you manage pregnancy through birth control? The issue makes the heart feel tired. It also reminded me of a song sung by the gospel singer Mahalia Jackson that I heard many times growing up. There is a line in it that goes like this: “God’s eye is on the sparrow, and I know He watches me.” It must have been very comforting idea to people trying to endure slavery and then racism. I wish somebody really famous would change the preposition in that gospel song and popularize it worldwide. It would certainly complicate things–as in research labs–but it might accelerate the changes already afoot that have been fueled by human compassion for all living creatures. 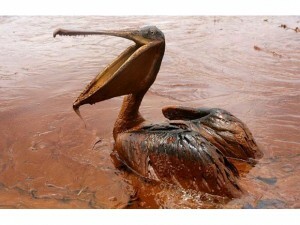 And now my mind goes back to one of the tragic images of wildlife sickened by the BP oil spill back in 2010. The news media frequently replayed one of a lone pelican, still afloat, suffocating in crude, great gobbets of oil dripping from its beak. It seemed to be in shock, but the eyes continued to open and close on the vision of a hellish catastrophe. It would have been unnerving to imagine God seeing us through the dazed eyes of that pelican. Brilliant, Ellen…….this one moves me more than all writing I have ever read!!!! Thank you Ellen…there is no greater truth than your post today. Gracie dog and all the creatures of the Earth compassionately resound. YES! It is so. Many thanks, Michelle. Always love to see you check in. Many thanks, Elizabeth. I’m very touched. Hope you had a great weekend. Thanks, Ellen. I don’t think we can receive too many messages to be mindful of our fellow creatures. It would be nice to think that we would do the right thing (when we can figure out what that is) by them just because it is the right thing, but it never hurts to threaten consequences.